Address: 674 Hay St, Perth, WA. 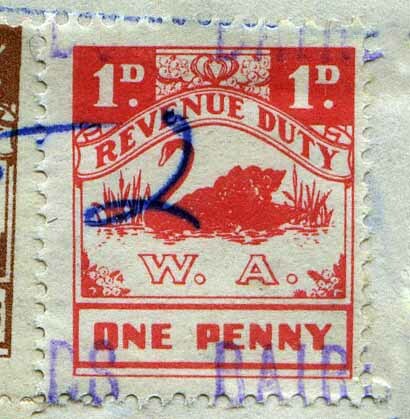 Revenue Use: 1923 issue: 1d. 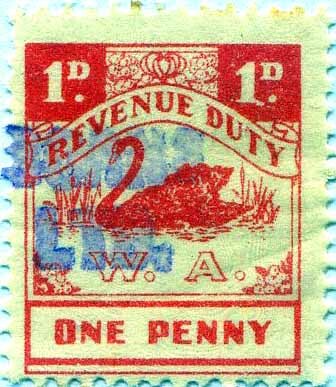 Rarity Scale: 1923 issue: 1d R3. 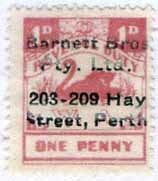 Background: The first records of a company named “Barnett Bros” appear in a Commercial listing from Perth of 1897 in which the company is listed as Manufacturers Agents, Eagle Chambers, 408 Hay St, Perth, WA. Later in 1905 the company is listed as, Glass Merchants at 491 Hay St, Perth and this is confirmed by records of the construction of early Churches in Perth which refer to glass supplied by the company. By 1932 Barnett Bros Glass and Hardware was located at 674 Hay St, and in 1934 the company shifted to premises at 203 -209 Hay St, Perth, WA and they were still at this location in 1950 when this image below was taken. The company was still trading in 1978 but like other smaller hardware operations in Perth they were absorbed into the growing Bunnings Company during the 1980’s. Address: 203-209 Hay St, Perth, WA. 1923 issue: 1d (mono colour), 2d, 3d, 3d (double overprint), 6d, 1/-. 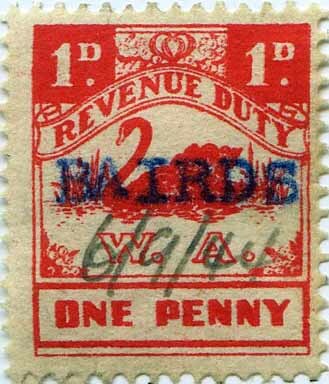 1923 issue: 1d (mono colour) R2, 2d R3, 3d R2, 3d (double overprint) R4, 6d R3, 1/- R4. Background: The founder of The Bairds Co. Ltd., William Hutchison Baird was born in Ballarat, Victoria, in 1869. After working for the Ballarat Hardware Co he moved to Coolgardie (WA) in 1895 and in 1896 he established the Coolgardie Hardware Co.
Later he was joined by two brothers and three sisters and the business was carried on as a partnership. In 1897 the firm opened branches in Kalgoorlie and Boulder and in 1898 in Perth. 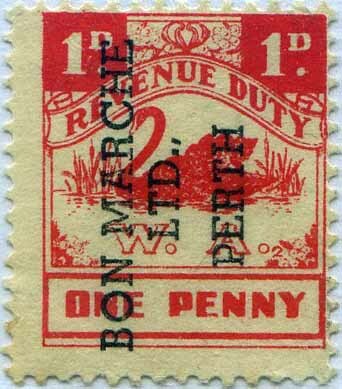 In 1903 the Perth branch grew to be both a shop and mail order centre. From 1910 the Perth branch was located in Baird’s Arcade (491-493 Wellington St) and there range grew with their catalogue being widely known as the “Farmers Bible”. In 1917 Bairds was formed into a private company and they moved their headquarters to Murray St in 1919. The company and the family members played a roll in Munitions management in WA during WW1 and during the Depression of the 1930’s the company minimised retrenchments and offered extended credit to farmers, a policy that they repeated during WW2. William remained Managing Director until his death in 1947 and at this time he was replaced by his younger brother Adam. Adam in turn died in February 1954 having passed much of the responsibility for the management of the company to his son, Hugh. Hugh died in 1965 and in 1969 the company was purchased by the Myer Group. 1923 issue: Black overprint: 3d, 6d. 1943-1957 issue: Brown overprint: 1d. 1951 issue: Black overprint: 1d, 3d, 6d 1/-, 2/-. 1923 issue: Black overprint: 3d R2, 6d R2. 1943-1957 issue: Brown overprint: 1d R2. 1951-1965 issue: Black overprint: 1d R1, 3d R1, 6d R2, 1/- R1, 2/- R1. 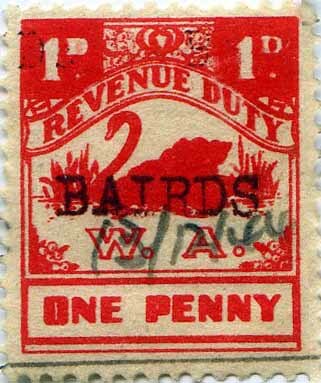 Background: See THE BAIRDS CO LTD./PERTH.a above. 1943-1957 issue: Blue overprint: 1d. 1943-1957 issue: Blue overprint: 1d R3. Address: Wellington St, Perth, WA. Background: *Boans Limited was a Department Store that operated in Perth from 1895 until 1986. The company was started by brothers Harry and Benjamin who had arrived in Perth, from Broken Hill, in mid 1895 and purchased two quarter-acre blocks facing Wellington Street opposite the Perth Railway station. Harry and his other brother Earnest had previously operated a successful drapery business, named Boans Bros Ltd in Broken Hill. The brothers (Harry and Benjamin) borrowed extensively but by November 1895 they opened a single storey store named, 'Boan Bros.'. The business was very successful, but Benjamin died in 1901 and Harry took sole ownership. Harry continued to expand the store purchasing adjoining properties. The business was restructured to become a limited company in 1912 and the name was changed to Boans Ltd. In that year the original buildings were demolished and rebuilt as a single building between Murray and Wellington Streets. Boans Ltd like many other Department Stores supported their direct retail activities through Mail Order Catalogues and these were supported by large and active mail order departments. This became an important aspect of the Boans operation from the 1930’s until the 1950’s. In the 1970’s the company expanded into the growing suburban shopping complexes in Cannington, Morley, Innaloo, Booragoon and Medina. In 1979 the Boans main store in Wellington Street was damaged by a major fire and it was closed for some weeks. In 1986 the site was sold to Coles Myer Ltd to make way for the new Forrest Chase Myer complex. 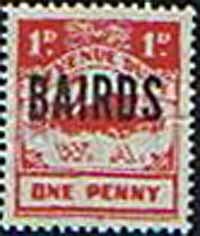 ** Recorded here for completion as no records exist who overprinted this issue. It may have been Boans Ltd or by the Government Printer. 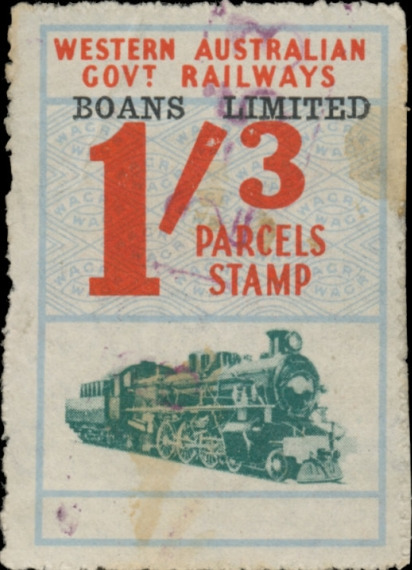 Many other Australian States railways had company names printed on them by their State Government Printer. 1951-1961 issue: [bold overprint at 45%] 3d, 1/-, 1/3d, 2/6d. 1951-1961 issue: 3d R4, 1/3d R4. 1951-1961 issue: [bold overprint at 45%] 3d R4, 1/- R1, 1/3d R4, 2/6d R2. 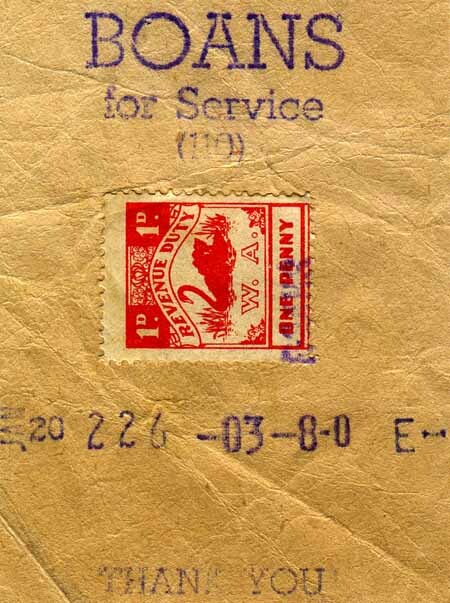 * Recorded here for completion as no records exist who overprinted this issue. It may have been Boans Ltd or by the Government Printer. 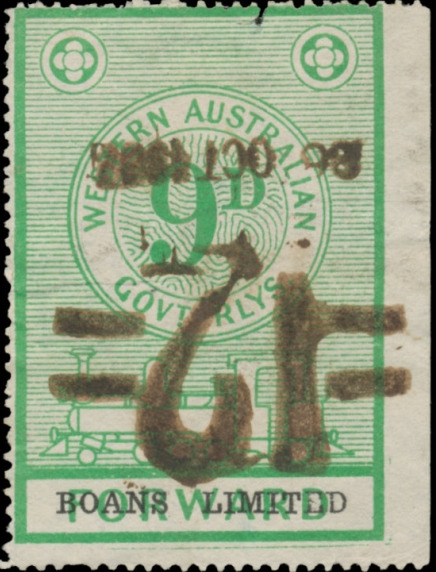 Many other Australian States railways had company names printed on them by their State Government Printer. Blue overprint: 1d R3, 3d R4. 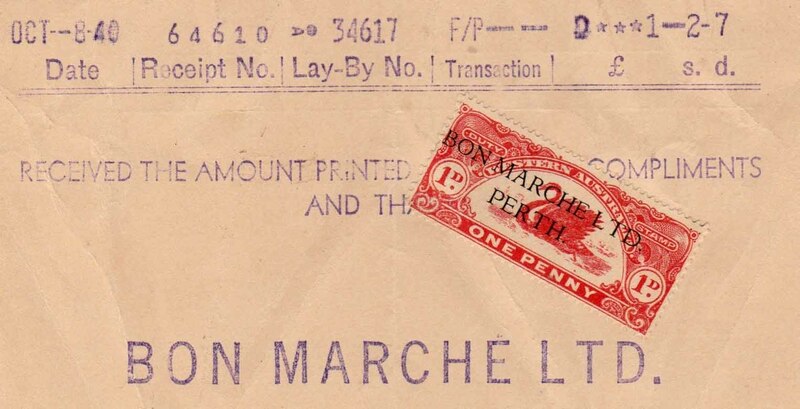 Background: *The Company that became Bon Marche Ltd was started in the early 1880’s in William St, Perth, WA by E T Hope and was known simply as E T Hope’s Store. Hope died in 1894 and the company was purchased by George Cargeeg and Elias Dimant who traded as Cargeeg Dimant Co from premises in Howick St (eastern Hay St) before moving the store to its Hay St location in 1897 and renaming the company Bon Marche after the famous Parisian Department Store. The business occupied a Hay St frontage but extended an entire block back to Murray St. Collectively the buildings were known as the Bon Marche Buildings but they were built around the central Bon Marche Arcade. The company was incorporated in 1897 and became Bon Marche Ltd. The company established a branch in Fremantle and later Bunbury. Later development of the store is attributed to E F Pritchard (some sources G Pritchard) who was admitted to the partnership along with A E Joyner in around 1912 Pritchard served as Store manager before acquiring a controlling interest and becoming Managing Director. Pritchard died in 1935 but the store continued to trade until it was acquired by David Jones Ltd to trade as David Jones of Perth. 1922-1930 issue: 1d(black), 2d(violet), 3d(black). 1922-1930 issue: 1d(black) R3, 2d(violet) R3. 3d(black) R4. 1943-1957 issue: 1d. [with or without commer after LTD].